After Bayern fell short to Gladbach, Tuchel’s men had a rare opportunity to close the gap at the top of the league on Saturday. Despite a tense final 5 minutes to the match, Dortmund were able to add to their win against Stuttgart through a late Kagawa winner. With a number of players missing from their spine, Tuchel had to work with a slightly depleted squad without the likes of Weigl, Hummels and Sokratis. Due to this issue, a somewhat makeshift defensive trio was formed with Matthias Ginter acting as a lone 6 in front of Sven Bender and the returning Neven Subotic at centre-back. Eventual winner Shinji Kagawa was reserved to the bench so Gundogan and Castro formed a double 8 pairing ahead of Ginter leaving Marco Reus and Henrikh Mkhitaryan higher up behind Aubameyang. This formed more of a 4-3-2-1 formation as opposed to the more commonly-seen 4-2-3-1/4-1-4-1 shape we see from BVB. Wolfsburg started in their usual 4-4-2 shape with Draxler and Caligiuri acting on the left and right win respectively. Schurrle played centrally, just behind and to the left of Kruse in what was ultimately a dysfunctional attack. Before dropping into a lone 6 position, Josuha Guilavogui played in central midfield alongside Arnold. Without the ball, Dortmund were set up in their narrow 4-3-2-1 with Marco Reus and Henrikh Mkhitaryan situated in front of the 3-chain in deeper midfield. The pairing were defensively strong and supported the rest of the midfield well with the capability to intercept a few Wolfsburg passes in development. With these two together central and Aubameyang also close by ahead of them, Dortmund could then threaten after regaining the ball in transition. Particularly when Arnold moved forward, the away side could exploit space left in midfield through their combinations between the attacking trio. This is exactly what happened in the build-up to the first goal where Mkhitaryan stole the ball off of an isolated Guilavogui to then play it through a completely open defence for Reus to finish. Although credit must be given to a competent defensive organisation from Dortmund, they were not challenged to a great extent against a Wolfsburg attack which lacked threat. For large parts of the first half Hecking’s side were unable to form strong structures around the ball with weak spacing as the passing options were not only few but weak too. They were clearly inferior to Dortmund during these moments as they couldn’t establish many telling attacks from a narrow position. In their game strategy they played many long diagonal balls as they looked to free the ball-far winger for overloads and short combinations with the full-back. During such situations they did carry some potential but only a few times was this successful. Their plans to integrate the ball-far winger through long switches were probably influenced by Dortmund’s defensive block as the more central Reus and Mkhitaryan didn’t always support their full-back. The ball-near 8 shifted over quite well however to close off any diagonal avenues back into the centre of the pitch which lessened the attacking potential of such plays well. At the 30 minute mark we saw Wolfsburg move towards a 4-1-4-1 formation as Josuha Guilavogui drop into a lone 6 position whilst Arnold was joined by an inside-moving Draxler in the centre. 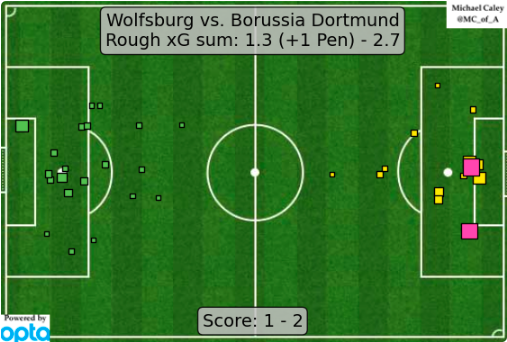 From doing so, Wolfsburg could benefit out of possession with a greater presence through the centre of the pitch which helped combat the orientation of Dortmund’s attack. Guilavogui offered better defensive presence between the lines with Draxler now supporting in CM allowing the Wolves to better cover the actions of Mkhitaryan and co. They also benefited somewhat in attack as connections around the ball came better without both Schurrle and Kruse high up centrally and the triangle formed in midfield. Although Guilavogui didn’t possess the skillset for the demands of a lone pivot in possession (as shown by the opener), this was amended at the break as Arnold took over his role whilst Kruse dropped into midfield as Dost came in at striker. With Weigl out of the squad, Dortmund had to settle for an ill-equipped Ginter at the base of their midfield triangle. Despite having an excellent start at right-back under Tuchel, the young German struggled in his central role with awkward positioning and without the technical abilities with the ball. Nevertheless he acted almost exclusively through the centre (compared to more horizontal movements from Weigl) and could act as a deep 6 but also made some involvement just behind the two 8s. Although his movements through the right half-space are quite common, Gundogan was more frequently dropping towards the right-back position as Piszczek moved into advanced positions down the right. If the full-backs move so high without any balancing in deeper spaces, possession can be difficult to advance without that connection down the right. Because of this however, they were often missing Gundogan’s influence through the middle which was heightened by Ginter’s struggles. Gundogan’s abilities were not utilised to anywhere near their potential which suggests that better alternatives could’ve been found as opposed to his movements to right-back. After picking up a back injury early on, Gundogan’s problems were then exacerbated early in the 2nd half which lead to him leaving the field for Kagawa’s introduction. 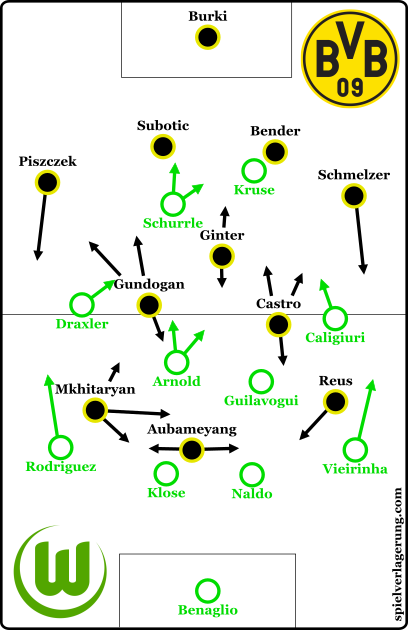 The Japanese midfielder moved to his usual position on the left of the midfield triangle whilst Castro took over Gundogan’s position on the right. Without their influential German, Dortmund lost some of their playmaking abilities in possession and subsequently were lacking the control they usually display with the ball. Although Kagawa is a brilliantly intelligent football with particularly strong collective-tactical characteristics, he doesn’t share Gundogan’s ability to dictate the possession game and without Weigl, BVB were lacking in this area. Ginter is not really at all equipped for a role at defensive midfielder whlist Kagawa and Castro both share similar qualities in their combinative and generally collective-oriented attributes. The result being a weakened Dortmund midfield which, although strong in some areas, missed the playmaking abilities which Gundogan brings to the table. This showed in the rhythm of the game as Wolfsburg improved at the expense of a weakened possession game from the opposition. Tuchel seemed to notice this and he made some changes to the midfield orientation and shape. They embraced their loss of Gundogan and the team were now more focused on creating chance in transition by using the above-mentioned qualities of Kagawa and Castro in a mix with that of the front three on the counter-attack. Through doing so they managed to still create dangerous opportunities such as the counter-attack in the 73rd minute, where Kagawa combined through the centre to free Mkhitaryan who just missed Reus with the cross. The manager’s changes not only managed to lessen the effect of the loss of Gundogan, but through changing the orientation allowed Dortmund to make more use from the Kagawa-Castro pairing in what could’ve been a difficult situation for the away side. Michael Caley’s xG map, showing Dortmund’s superiority over Wolfsburg. Despite lacking the spine of their team through defence, Dortmund were still able to put in a relatively strong performance against one of the better teams in Germany. They were particularly strong through the opening and could’ve gone on to finish with a more dominant scoreline had it not been for the quick changes by Hecking.